After introducing Sony Ericsson XPERIA X10 now Sony Ericsson is yet comes up with latest Smart Phone known as Sony Ericsson Vivaz. The Sony Ericsson Vivaz, formerly known as the Sony Ericsson Kurara has now gained a video hands-on review and we bring you said Sony Ericsson Vivaz hands-on courtesy of the guys over at daily mobile. Spec wise the Sony Ericsson Vivaz is basically the same as reported with the Sony Ericsson Kurara with just a name change; however those specs are a 3.2 inch WVGA touch screen, 8 megapixel camera with geo-tagging, image stabilization, and HD video recording. 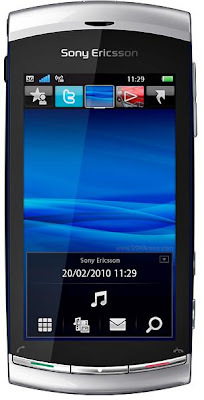 Sony Ericsson’s latest multimedia-centric phone, the Vivaz, follows on from the Xperia X10 and is the second phone in the new family of communication entertainment phones coming to market 2010. Some say the Vivaz, announced today, looks to bring some serious competition to the smartphone scene with its HD-capable, 8.1 Megapixel camera that can shoot 720p video. The Vivaz also features 8GBs of storage, a 3.2” screen, out of the box Facebook and Twitter integration, access to upload onto YouTube and Picasa in high resolution while still using other features on the handset via Wi-Fi, and a bunch of other bells and whistles. The Vivaz will be available in selected markets from Q1 in the colors Moon Silver, Cosmic Black, Galaxy Blue and Venus Ruby.